Anaconda seems to release a barn burning set of drill results about once a month. They get ignored every other day. Go figure. . .
Latest results came out on April 4, 2019 showing 42.85 g/t gold over 3.8 meters and another intercept of 9.83 g/t gold over 3.5 meters. From a technical point of view, assays such as that are called BFD results. One day down the road some wise investor will realize that those are really good results. 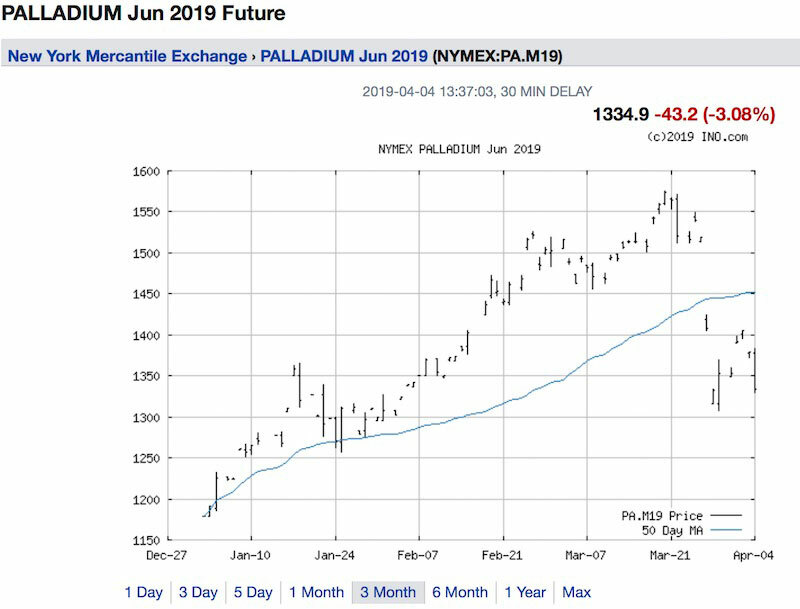 I’m not a betting man but if I were a betting man I would be looking for a decline of silver and gold into May/June. As I predicted, palladium fell off a cliff and platinum went into overdrive higher. I do like corrections because they set markets up for spectacular results if you time them right. The next big move is higher, perhaps much higher. Buy what is cheap, sell what is dear. I own shares, they are advertisers and as always you are responsible for your own investments decisions.